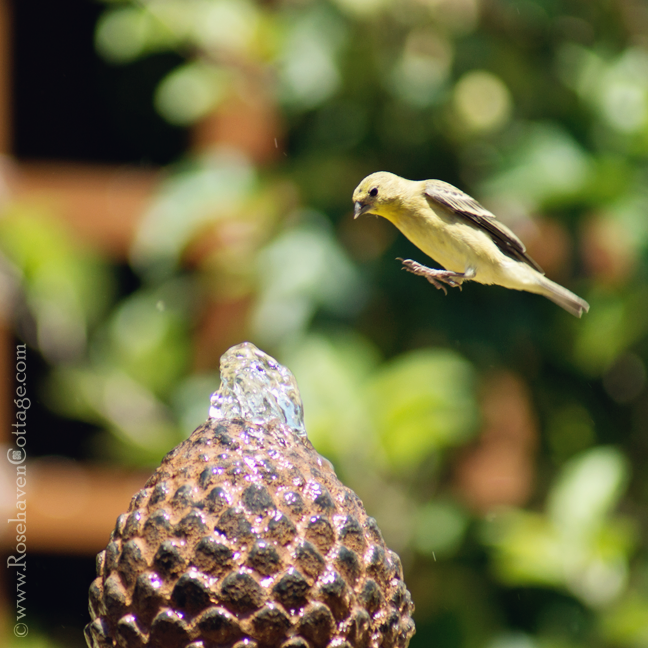 If I sit quietly in my chaise under the shade of the oleander with my camera and telephoto lens at the ready, I sometimes get the choice privilege of witnessing the dance around the bird fountain. 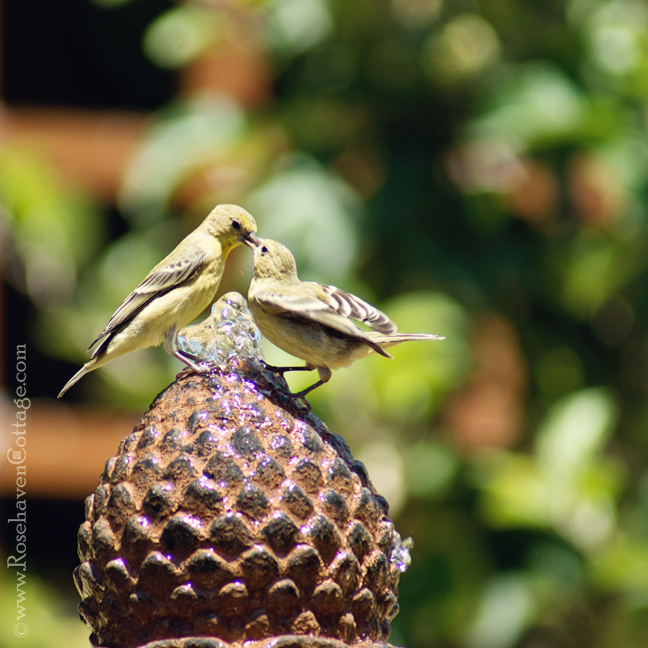 The finches are visitors at this time of year. 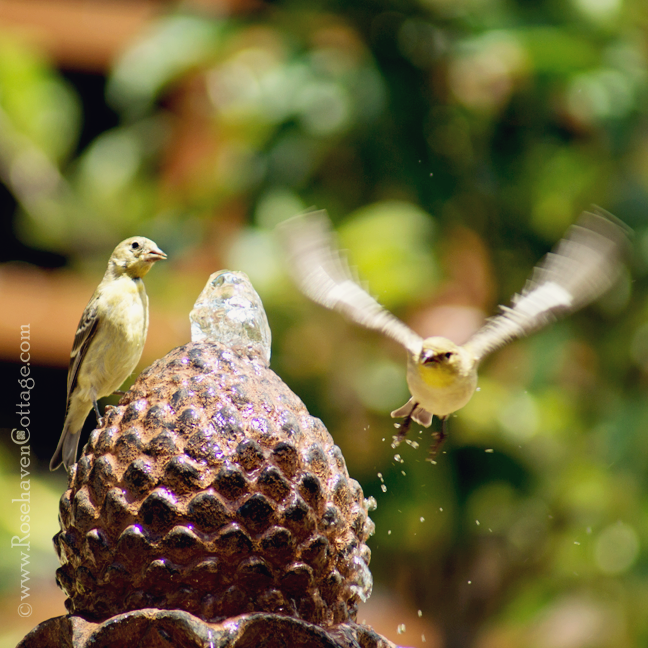 And one particular finch family is frequenting the fountain today. First, Papa Finch comes down to get a drink and also to check out the current safety of the fountain to see if it's okay for the rest of the family to come down too. Then Mama Finch swoops in gracefully, looking much like a ski jumper in flight. Mama Finch is then joined by the young fledgling. Mama is teaching her juvenile how to drink but still has to help out sometimes by giving the fledging water directly. It will learn to do this on its own with Mama and Papa's great coaching. The fledgling looks puzzled when Mama or Papa flies away. It is a tactic to try to get the young one to discover drinking directly from the fountain on its own. 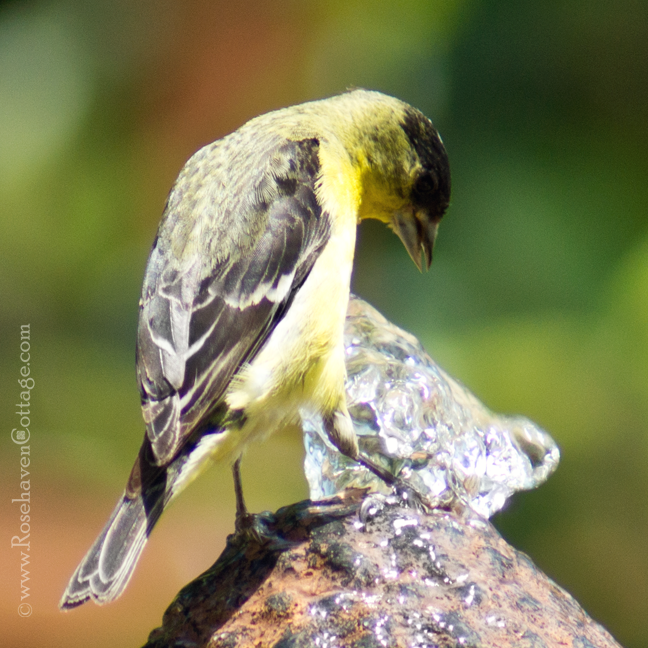 The finches don't own exclusive rights to the water fountain, so they have to know when to share. 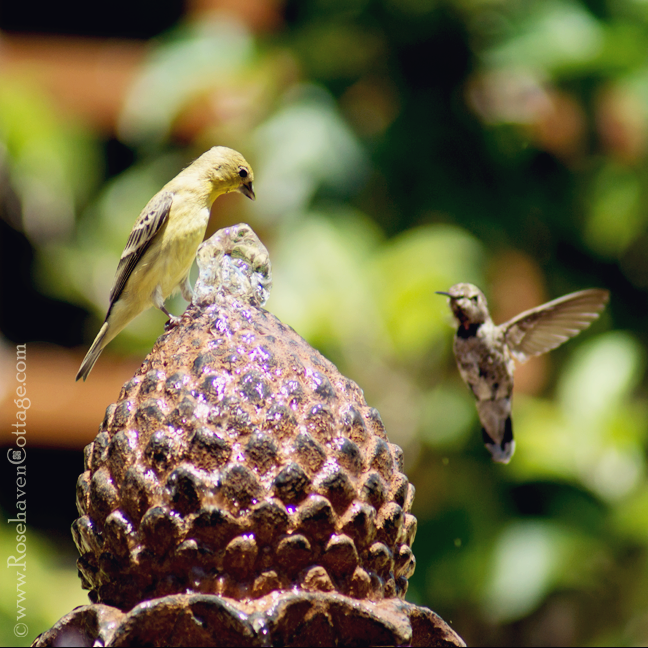 When a female Anna's hummingbird approaches, the finch gets one last drink and then acquiesces to let the hummingbird take a turn. 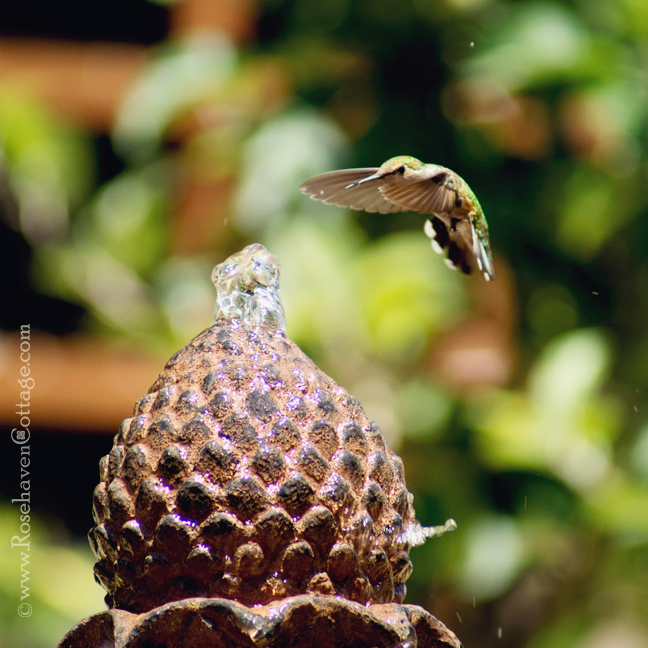 This female Anna's is a little more cautious in approaching the fountain than other hummingbirds. She may be young or she may simply be out of her territory (hummingbirds are highly territorial and will chase off interlopers as soon as they are discovered). She flits and darts as if she's trying to view the gurgling water from every possible angle before imbibing. She is probably feeling little droplets of water as they splash off the fountain. You can see some in the photo below. 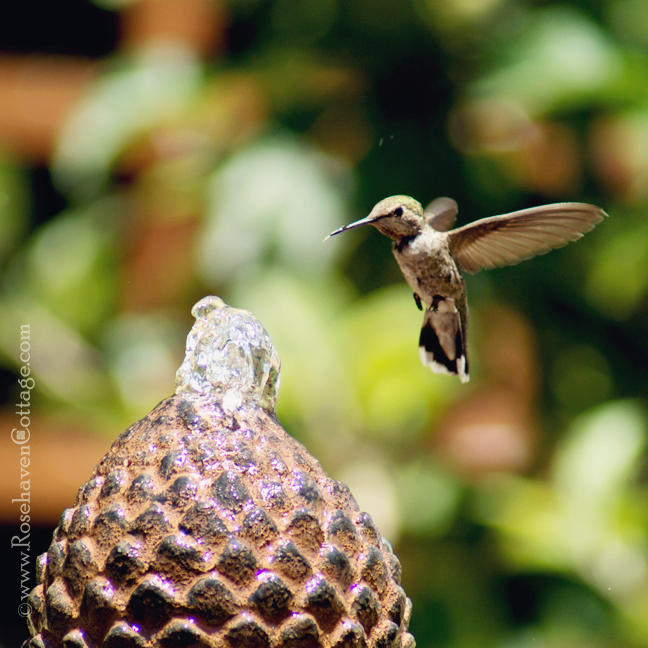 The hummingbird is sure she wants to get a drink now and sticks out her long little tongue in anticipation of sipping from the burbling water. She darts in and back out over and over with her tongue out catching little sips every time she goes close to the water. 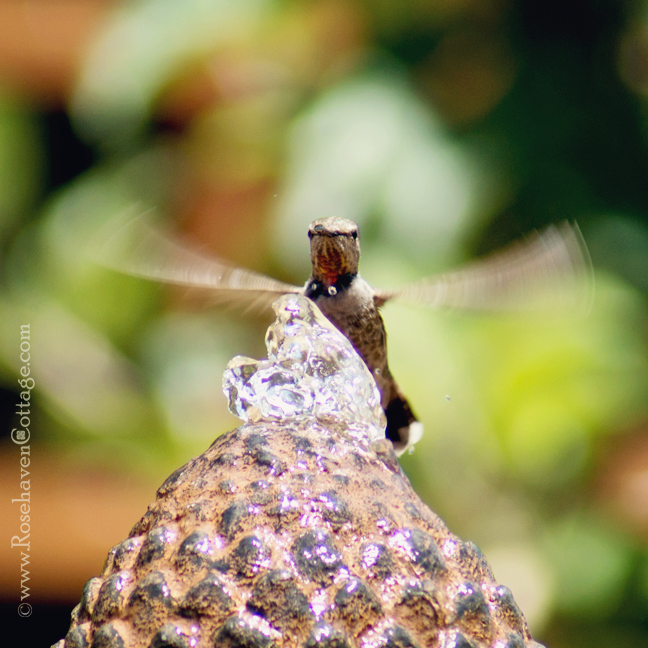 After a few drinks, the hummingbird decides she has time to take a bath too. She sits her tiny little body right in the middle of the action and drenches herself. Over the next minute or more, she is often completely enveloped in the water. Clearly, she loves baths. She's happy, content, and, eventually, very clean. 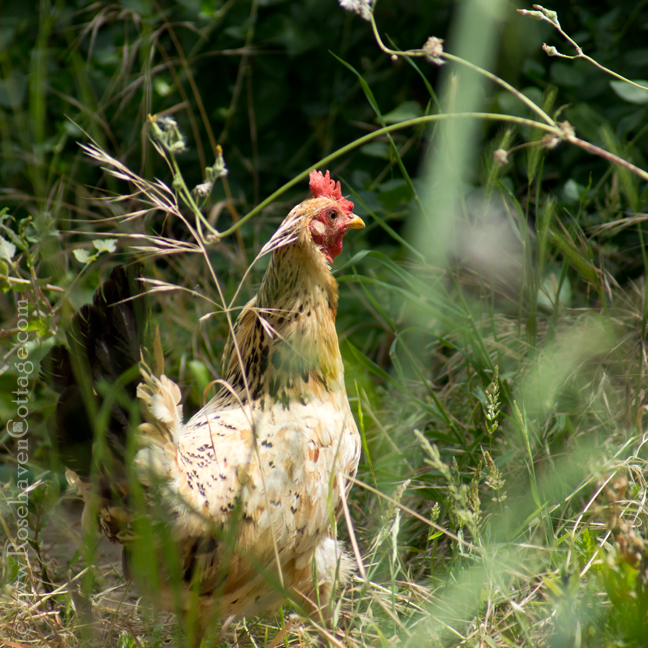 Not too far away from the bird fountain amidst the tall-ish grasses growing at the edges of the flagstone and gravels paths that meander through the garden, the visiting feral chicken (who showed up last week) is playing "jungle fowl" and hiding from me as she usually does. But my telephoto lens catches a glimpse of her anyway from across the pond that stands between the two of us. She's not a fan of humans or cameras. So I feel extremely lucky to have gotten another shot of her. Breathtakingly beautiful photographs! Fascinating to see the activity scene by scene. And what a photo of the chicken. Nature is so wonderful! Oh my gawd, Cindy. You got some awesome shots! I'm so envious of you and others who are able to capture birds on film. My little pocket camera is just not up to the task. Amazing shots Cindy!! 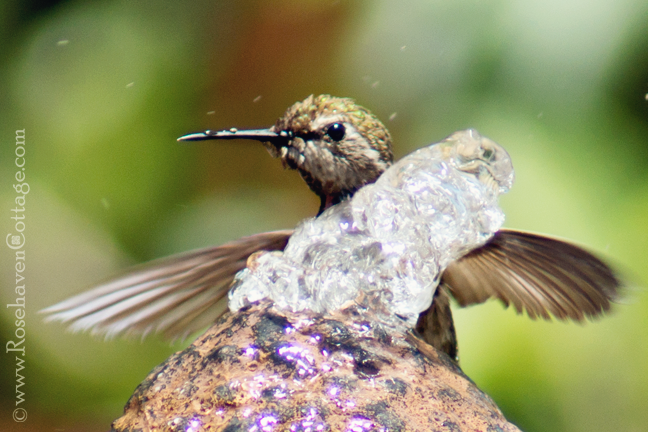 I especially love the little hummer caught in her bathing ritual...love them! Oh Cindy, what a opportunity to get those amazing photos. 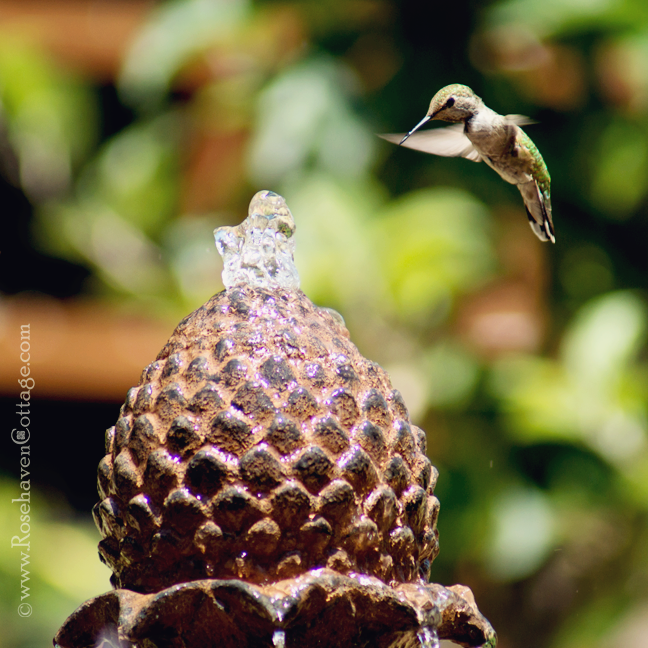 Imagine seeing the hummingbird dashing into the water....sigh. I am just delighted with your birdie-tails! I love that you are the invisible person in the garden. Please keep sharing these wonderful experiences. 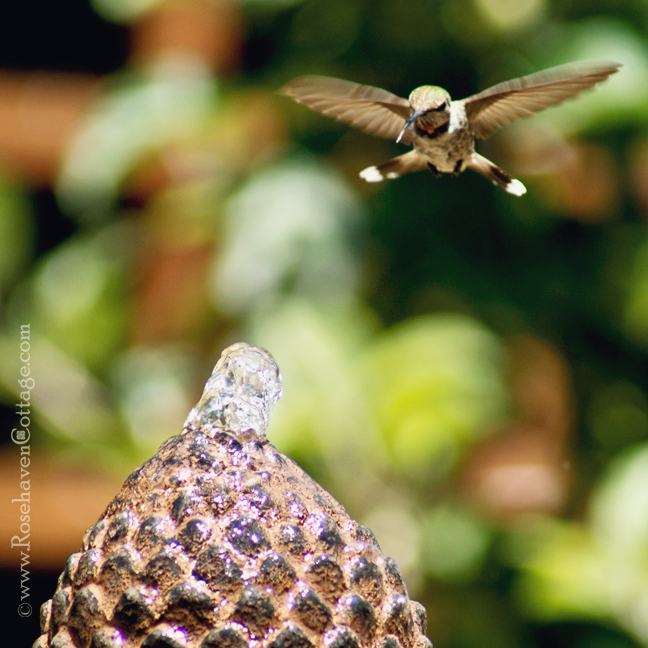 My favorite thing about hummingbirds? Their funny little *humming* as the dart about my yard... I can always hear them coming... and going.